Those of you who follow my blog have heard me talk about my blogging buddy, Teresa, of Tickell Expressions. Although we have never met face-to-face because we live on opposite sides of the North American continent (she in Eastern Canada and I in western USA), in the past we've served together on a DT or two, and have just become really good friends over the years. She's such a wonderful artist and is always stretching into new media and techniques to polish and perfect her skills. 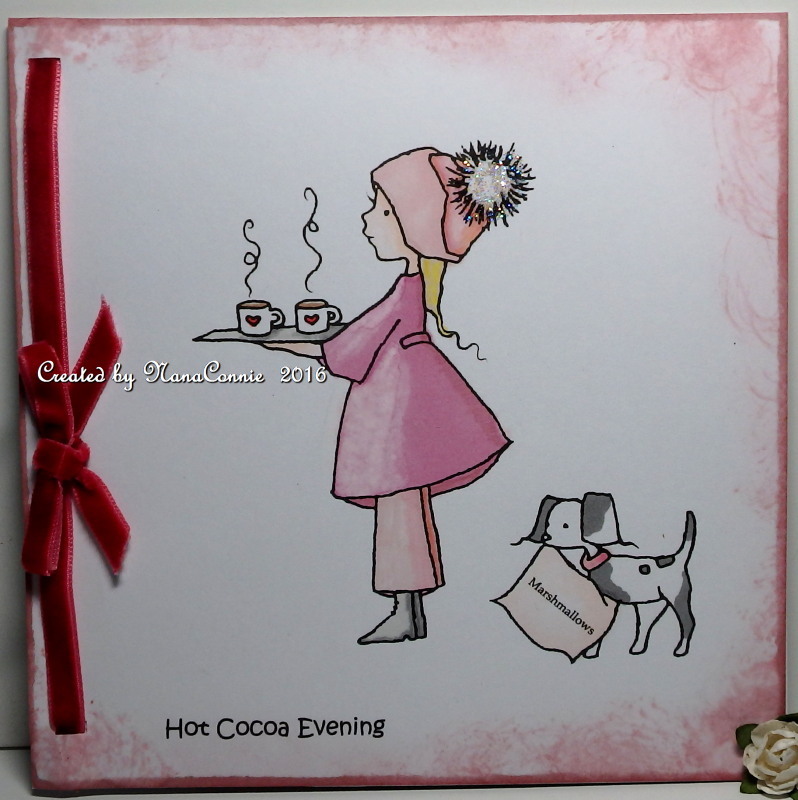 I've done other cards using several of her images which she so kindly posts as freebies on Sundays. As a way of improving her art, she offers anyone who uses one of her images the opportunity to ask her for something specific. I used one of her really elegant stags a few weeks ago and, when she asked me what I'd like for a new image, I asked her for something inspired by Sebastian, the adorable, ragdoll kitten who lives with her family, and that he be doing something cute. Yesterday, she sent me an early preview of the digi, and said the kitten is named "Smooshy." I used colors from the challenge at Sketchy Colors. 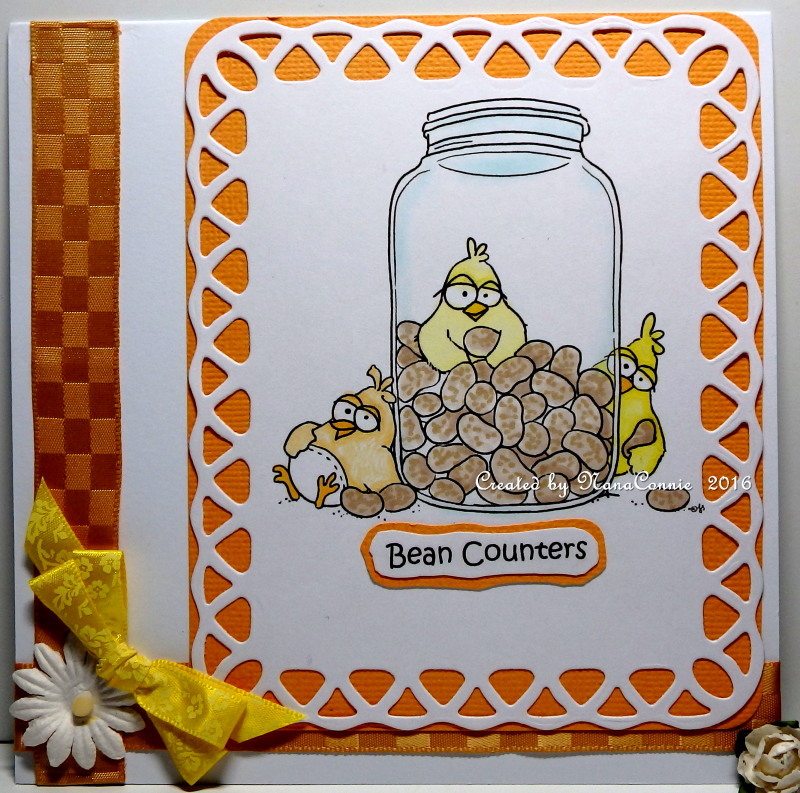 I used ProMarkers to color the image, then die cut it and the CS mat with one of my die sets from QuicKutz. The shaped card and the background dp were cut with another QuicKutz die. 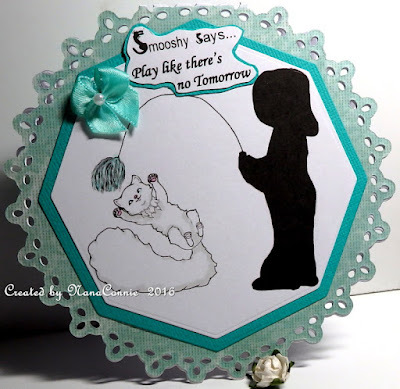 The "Smooshy Says..." sentiment is also Teresa's and comes along with the Smooshy image. I added the rest of the sentiment about "Play" using a computer font. The bow is one of those I make and toss into my stash for later use but it started as white ribbon and I 'dyed' it with ProMarker. Here's the actual image and you can get it today simply by visiting Teresa's blog. 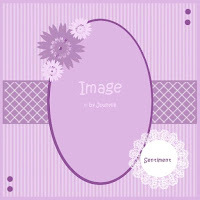 Look around her blog while you're there and if you like her artwork, become a follower so that you won't miss any of it. I follow her via email so that I get a reminder in my mailbox whenever she has posted something new. 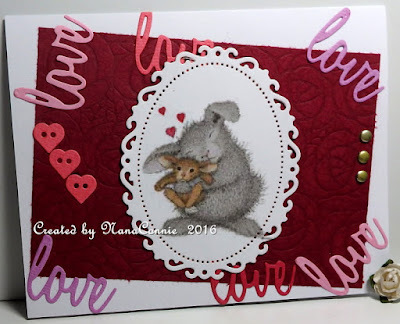 It turns out I'm going to have additional Grandkids and Great-Grands in town over Valentine's weekend so I'm cranking up the card making to have cards enough for everyone. This darling image from House Mouse/Gruffies is perfect for my first Great-Grand. 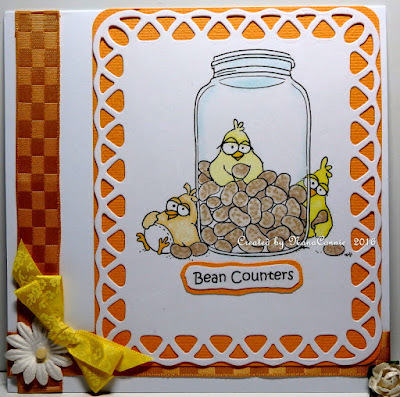 I colored with my ProMarkers and die cut the image with a die from Spellbinders. 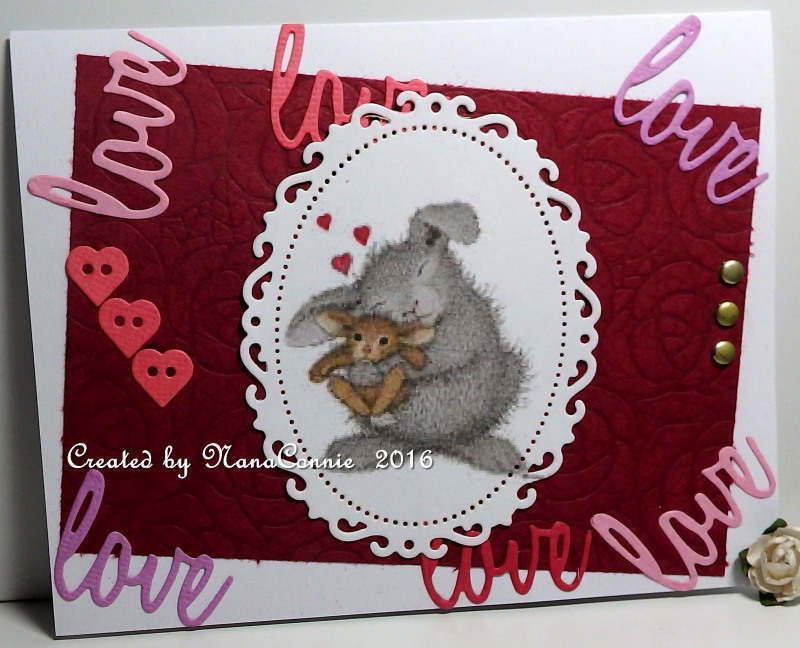 All the "Love" sentiments were die cut with the most recent set I purchased a couple of weeks ago but this is the first time I've used anything from the set (Sizzix/Tim Holtz.) I also used a new embossing folder to emboss the roses onto the cranberry red CS. 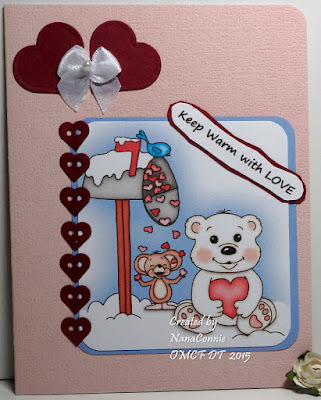 The heart buttons and brads seemed like perfect little embellies for this rather 'busy' card. 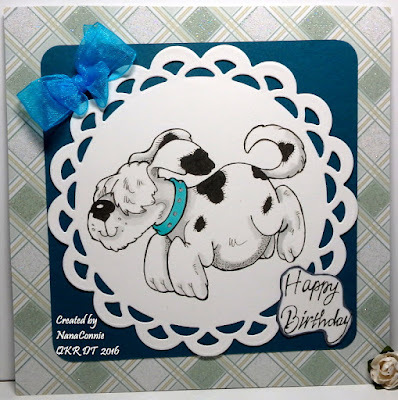 For the latest challenge at QKR Stampede this week, when our theme is "One for the Kids," I decided there was nothing better than a "Happy Dog (Digi 11303)" to make a great birthday card for a child. The sentiment is done with Digi 18302 "Happy Birthday." That Happy Dog is colored with ProMarkers, then cut with a die from my newest set ('Scallops' by Little B.) I matted that with Ocean Blue CS and punched the corners to round them. For the background, I chose dp from DCWV's Linen Closet stack. It's embossed and glittered for a bit of shine and sparkle. For the bow, I used sheer ribbon from The Ribbon Girl (sent to me as a gift by a blogging buddy in the UK. Thank you!) and tied a double loop, double layer bow. Is a Box Such a Big Deal? Boxes when they are just boxes are not a big deal. But when a box is the first one ever made using new tools and dies, THAT's a big deal! And this is the first ever box made by and decorated with my own hands. Just in time for a celebration of Valentine's Day. This photo shows how I decorated two sides of the box and the top. solid-chocolate Hershey Kisses they make for Valentine's Day. This is a shot that better shows the butterfly on the top of the box. The doilies and the butterfly are cut with dies from Cheery Lynn. 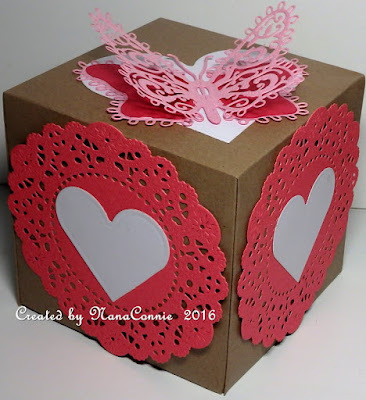 The hearts are cut with Spellbinders' dies. The box is done with a board from Memory Keepers. 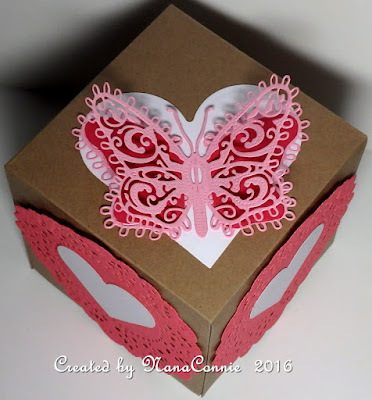 I double cut the butterfly, used a matching angel wing die for the darker pink cuts, and adhered it all together along the body for that layered look. Then it's popped up with dimensional dots onto the white heart. 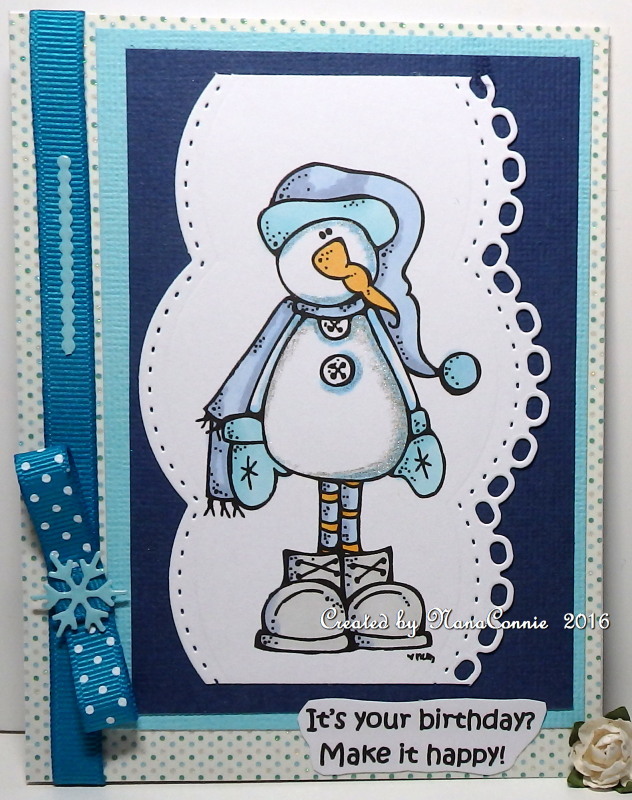 I'm still working on getting my stash of birthday cards restocked so here's another fun winter card. 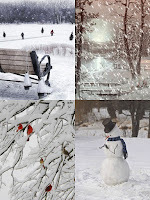 The snowman image is from Melonheadz. I used the colors from the challenge at Color My Heart. I used my ProMarkers to color the image and added a bit of sparkle with gel ink. This time, I did something a bit different when it came to cutting out the image. I took two of my new border dies (Spellbinders), placed one on each side of the image and used them to die cut it, trimming it top and bottom with my paper trimmer. The background polka dot paper is embossed and glittered, and the ribbon came from Really Reasonable Ribbon. The snowflake is a die cut, too. 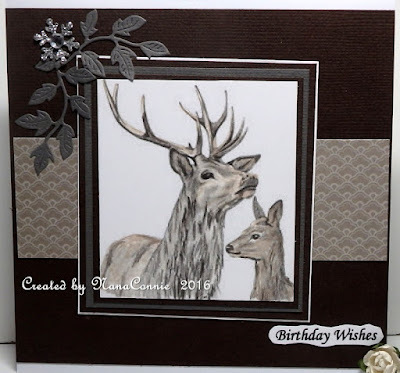 Even though I posted on Saturday and expressed how excited I was to now be a member of MHK Designs DT, today is my official introduction as a team member so I'm sharing one more card. 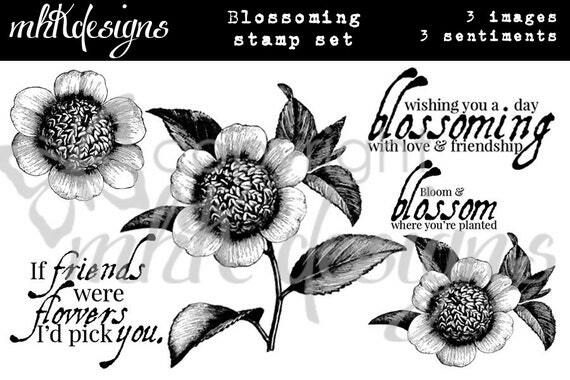 This gorgeous image comes from the "Blossoming" set, as does the sentiment. 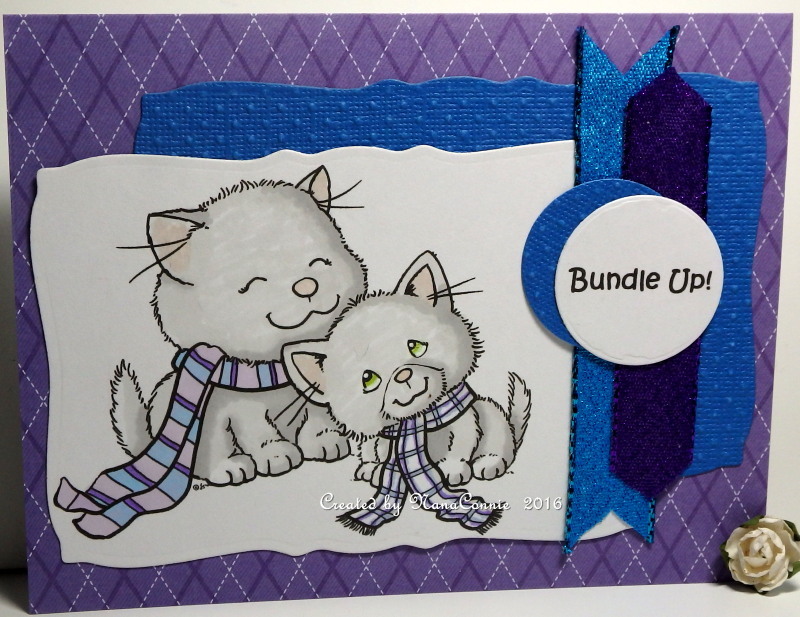 I colored it lightly with my ProMarkers, then die cut it with one of my newest Spellbinders die sets. Oh, yes, I'm really going to love this set of dies! I layered that onto black CS and hand cut around the outside shape so that the black makes a mat behind the negative parts of the die cut. The entire image piece is adhered on Pop Dots. 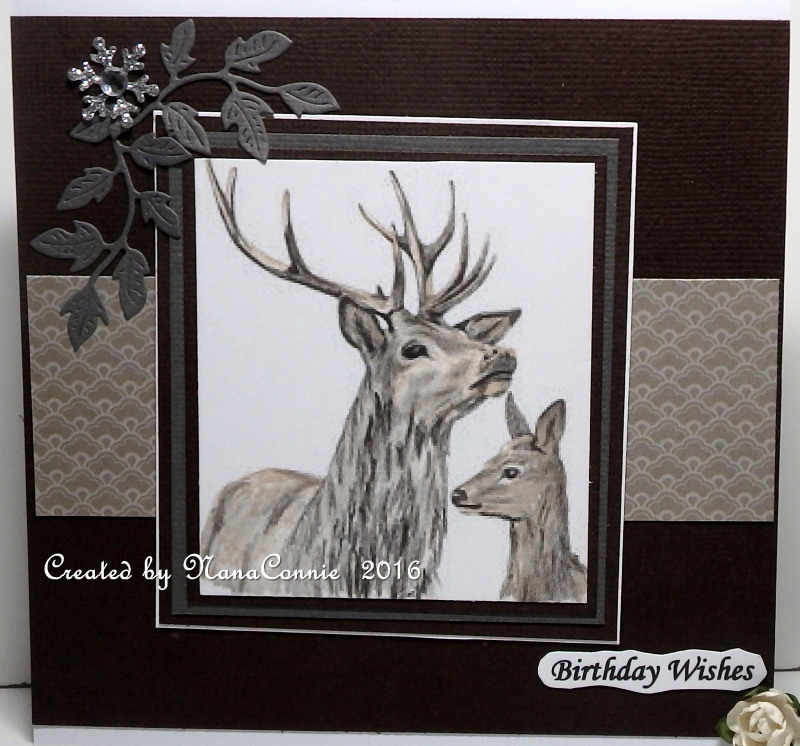 I used Swiss Dot embossed CS and added black ribbon across the bottom of the card. The Bow Tie bow was made on my new Zutter Bow-It-All. I'm going to be doing more of those, too. I love the way they look and, in fact, I used the rest of that roll of black and white polka dot ribbon, turning it all into Bow Ties. The sentiment was fussy cut and matted, then fussy cut again. I hope you're going to fall in love with Mynn's gorgeous designs as much as I have. She has the most fabulous combination of vintage and retro digis along with lots of shabby papers and modern sentiments. 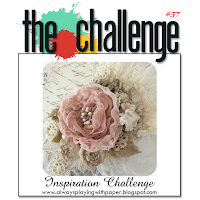 Don't forget that MHK Designs has its first ever challenge going on until February 16 and all you need to do is take a peek at the inspiration photo, and make something inspired by it. 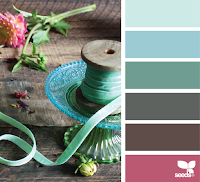 It might be the colors, the flowers, the ribbon -- you pick it. Then come play with us in the Challenge. You are NOT required to use MHKDesings products to enter the challenge BUT if you do, the challenge theme then is ANYTHING GOES. 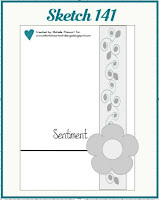 That means you can choose not to follow the challenge inspiration at all but only if you use MHK Designs products. We are not a card-only challenge. All forms of paper crafts are welcome: cards, scrapbook layouts, tags, gift card holders, boxes, bags, art journal pages, multimedia artwork, etc. Did you even know there was a day for appreciating dragons? 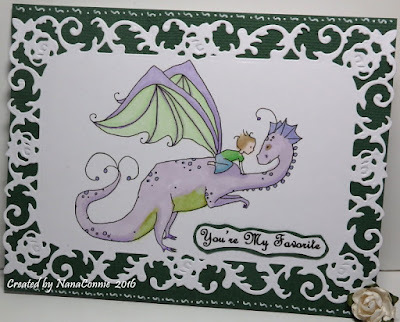 Since I have a granddaughter who loves dragons, and is crazy about every dragon card I make, so I knew about that unique Holiday. I'm going to use this as a Valentine card. How could you not want to share love with this obviously adored dragon? The image is from A Day for Daisies. 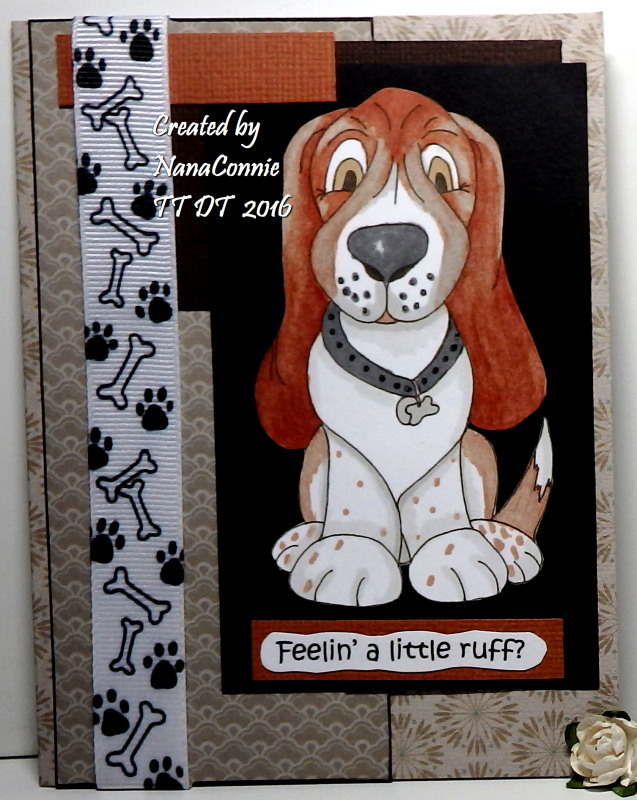 I used ProMarkers to color the image and then die cut it using one of my newest dies from Spellbinders. At Christmas, my SIL gave me a gift card to Amazon and I went crazy buying new die sets. I'm so happy! The die cut frame was so delicate and fancy that all I did was add the stitching and the sentiment. No ribbon, no flower embellies, no bling -- just the frame and faux stitching. Due to a series of things, this post is much later than I intended it to be. But at least I'm getting it posted now. I used my ProMarkers to color the image and die cut it with a simple circle die by QuicKutz. I cut two more circles the same size and used them to make an offset mat. The spotted dp is also from MHK Designs (You've Been Spotted - Brights.) Because it's digital paper, I was able to adjust the size, squeezing it to get oval spots instead of regular polka dots. The black lace came from my stash and the black pine cones are die cuts (Memory Box.) Finally, I added a small, black bow, one of those I make by the dozens and toss in my stash for future use. The sentiment is my own. I'm thrilled to be part of the MHK Designs DT ! 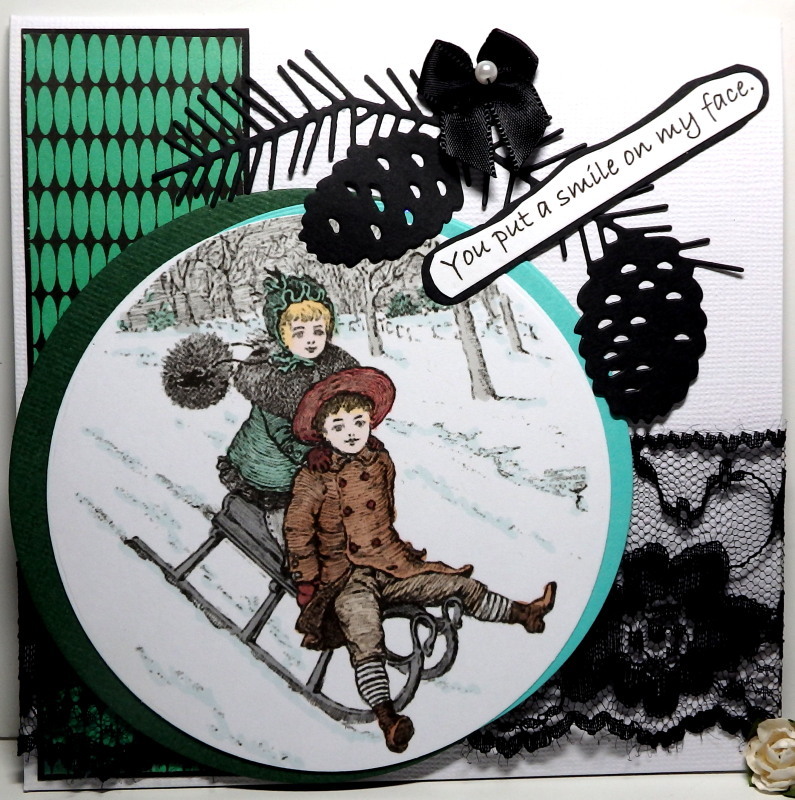 I love Mynn's artwork and the vintage images she creates. You'll be seeing lots more posts showcasing her work next month. If you see things you like, come join the challenge. You don't have to use an MHK Designs image, but we're just thrilled when you do. :-D You could win these two sets of images and also a set of papers, if you enter. Today starts this week's challenge at QKR Stampede and our new theme is "I'm Feelin' Blue" so we want to see plenty of blue on your cards. 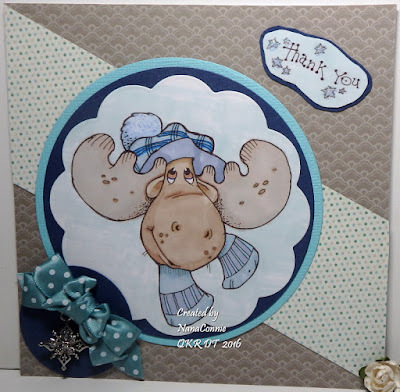 I used this fun and funky Digi 22301 "Winter Moose" and Digi 17407 "Thank You" for the sentiment. I still need a few more cards for saying "Thanks." 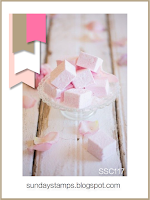 I chose these colors from Digitally Sweet. The image is colored with my ProMarkers, then die cut with a scalloped die (Spellbinders) and matted with two plain circle die cuts (QuicKutz). I also die cut a circle as a mat for the bow and the snowflake charm. 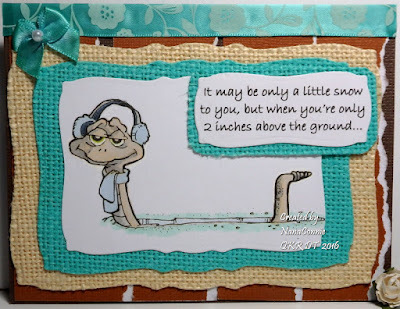 The background dp is from the "Linen Closet" stack by DCWV. All the papers and CS are new additions to my stash, most of them showing up right around Christmas or the after-Christmas sales. The ribbon I used to make the bow (double layer and double loop) came from Really Reasonable Ribbon and is also a new addition to my stash. My blogging friend, Lynn, sent me the charm a long time back after I saw one on a card she made and oooohed and ahhhhed over it. Maybe I should send her this card just to say "Thanks, Lynn." What do you think? 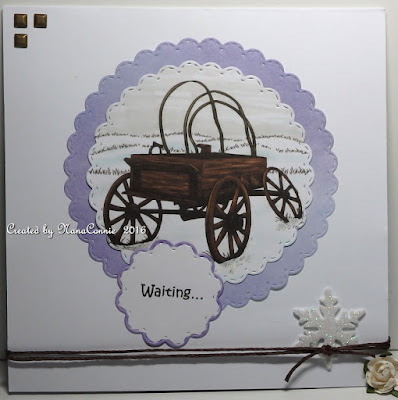 I love this old wagon image from Doodle Pantry. While it wasn't designed as a winter image, I did my best to make it look like it was out in a field after a morning of falling snow. 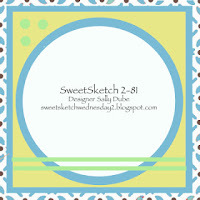 I based my card on the sketch at Sweet Sketch Weds. 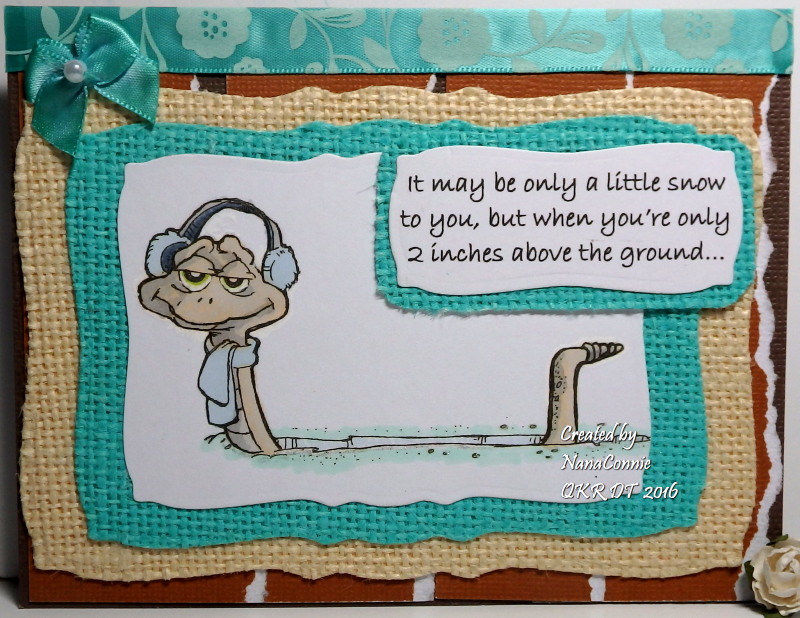 The image is colored with ProMarkers and gel ink, then die cut with a Memory Keepers stitched die. Both the sentiment and the dp for the mat are also cut with dies from that set. The mat dp is made using chalk on watercolor paper. The twine and glittered snowflake were both in my stash and the brads have been hiding in a drawer for a couple of years or more. Definitely time to use some of them. I found an image at A Day for Daisies which will show you (without any words at all) exactly what my life looks like on cold, winter nights! :-D As many times as I've visited the ADFD store, I don't know why I hadn't seen this image before, Maybe it's new to them as well as being new to me. Either way, I have it now and will use it many times, I'm sure. Have I shared with you that my fur babies have now decided that I must be their best friend? It only happens in winter when they need a warm body to cuddle. I chose my colors based on the photo inspiration at The Outlawz. I colored my image with ProMarkers and then used a Memory Box Stitched Squares die to cut it. I also cut the mat with another die from that same set. The CS for the mat was embossed using my "Linen" folder. I used kraft CS for the card base and stitched around it with white gel pen. All the flowers come from my stash and I added glitter to each one. The ribbon came from Really Reasonable Ribbon. New challenge starts this morning at Tuesday Throwdown and we're sponsored by our very own Crafty Girl. Our theme is "Under the Weather" so we want to see Get Well cards. I'm sure every one of you knows someone with a sniffle or dose of the flu so make a card to cheer them up. He's colored with my ProMarkers and fussy cut, then adhered to the black CS with dimensional dots. Unfortunately, that doesn't show very well in the photo but IRL, it's great. All the cardstock and dp pieces are scraps from the bin that had to be used or tossed. It was just waaay too full. I used as many as I could reasonably get on the card without it being too much. For embellishment, I chose to keep it pretty simple and used only the ribbon with the paw prints and bones because it seemed to fit with the image. 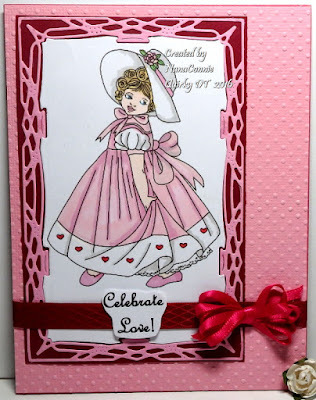 Today I'm sharing another card I've made, recycling one of the vintage and outdated cards given to me by a friend who found a small box of them at a yard sale. This one turned into a delightful feminine birthday card. the challenge at Always Playing with Paper. 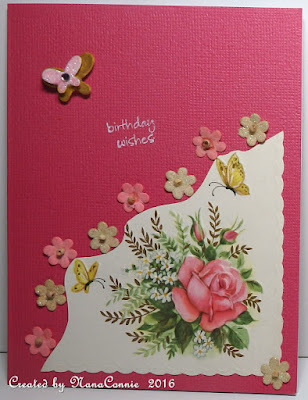 I fussy cut the inside corner of the card and used it as the focus image, adding some punched, colored with ProMarker, then beaded, flowers along the edge. 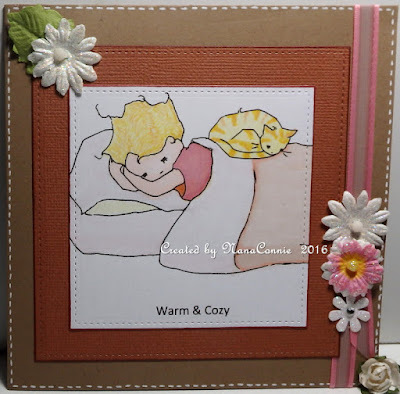 I ran the front of the card base through my "Linen" embossing folder. I used the folder without using the rubber embossing pad in the 'sandwich'. That's one of my favorites ways to use it because the embossing is always so subtle. The double butterfly was made using die cut butterflies, dimensional dots, and a gemstone. Finally, I used white ink to stamp the sentiment and called it finished. 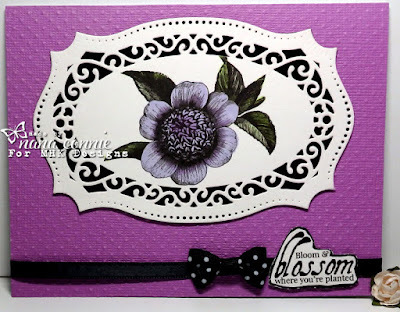 This card is a combination of old and new: the frame's die set (Cheery Lynn) is an old one that I've had for a while but haven't used very much and the wider ribbon is new. I colored the image with chalks and my ProMarkers, then die cut it and added the die cut frame. I matted those with burgundy CS die cut with a rectangle die (Spellbinders) and used a Swiss Dot folder to emboss the background paper. I did the multi-loop, single-layer bow using my new bow maker. We're starting a new challenge today and we have a really simple theme: "Lots of Layers." I think this is one of the funniest images I've ever seen at QKR Stampede! (Digi 12602 "Happy Snake") The sentiment is my own this time. The image is colored with ProMarkers and die cut with a die from Spellbinders. I used two layers of burlap as mats for the image because it gives such great texture. Besides, the burlap is new and it was right there on my desk, waiting to be put away, so why not use it? :-D Those mats are die cut with the same set of dies. I also matted the sentiment with burlap. Behind the matted image, I used torn CS and behind that a layer of dark brown CS. For embellishments, I added a strip of ribbon (brand new from Really Reasonable Ribbon) at the top of the card and then added one of the handsewn bows I make by the dozens and keep in my stash for future use. This one was made with white ribbon, dyed with marker to get the exact color I wanted. I noticed that the current challenge over at Delicious Doodles had to do with "Leftovers." Since I've really over-filled my box of scraps during the fall and holiday months, I went there first before going to my Delicious Doodles digi file to pick out an image. I had a ton of browns and grays in CS and one or two pieces of dp that would work so I decided on this gorgeous pencil-sketch image called "Deer with Antlers." I based this on the card sketch from Hannah & Friends. I also used the sketch from The Outlawz. Of course, I had to modify it for the shape of my image piece. I colored with my ProMarkers and added the sentiment. I die cut it with one of my dies from Spellbinders. I matted it with CS and rounded the corners with a punch. Both ribbons are from Really Reasonable Ribbon and the flower is from a new batch of white flowers I got from Santa. Pretty fast and simple. Open-Minded Crafting Fun is Back!! OK, we've all been waiting for the return of Open-Minded Crafting Fun which has been on a 4 month break. They've added some new DT members, taken back a few who were on the team once before (me! Bless their hearts), and several of the ladies who were on the team when they started the long break have stayed on. Changes include becoming a monthly challenge which will begin on the 10th of each month. Today starts our first challenge in 2016 and our theme is "Try Something New." That might be a new technique, a new product, a new card style... we just need to know what you used that's new. We have multiple sponsors for this challenge: Doodle Pantry ($10 GC); Imagine That ($10 GC); Polkadoodles (7.50 Euro GC); and finally Smeared Ink ($25 of digis). Unfortunately, Smeared Ink closed in December and, while they still will be sponsoring us, I can't link to their store anymore. Each of these sponsors provided images for the DT to use and my image came from Imagine That. It's called "Polar Love" and I think it's just the sweetest thing for a Valentine card. When the weather is nasty and the wind is howling, it's time to bring in the fur babies, make hot cocoa, and snuggle up on the couch, leaving the freezing cold outside where it belongs. This darling image from A Day for Daisies reminded me of "hot cocoa evenings" from my childhood. How could I resist making a card? and used the colors from Inspired by Stamping. The image and sentiment are both printed right onto the card front because I wanted a really CAS card. I colored with my ProMarkers, added a spatter of glitter to the pompom on her cap, and inked the edges. I sponged around the borders with an ink pad. This card was the first done in colors that allowed me to use my brand new velvet ribbon that I got for Christmas. I'm so crazy about that ribbon and I got it in three different shades of pink. This one is the darkest and, yes, it's just as soft and scrumptious as it looks! I'm really proud of myself for managing a post every day this past week. I had a miserable bout of the flu last week and it's taking forever to shake it off. I am up and about most of the day now but I did sneak off for a nap the last two days. I still have no voice and I tire easily but I've gotten a lot done despite that. Good Morning! It's time for another new challenge at QKR Stampede and for those of you who love doing Clean and Simple designs, this is the challenge for you. Our theme is CAS; just that simple. 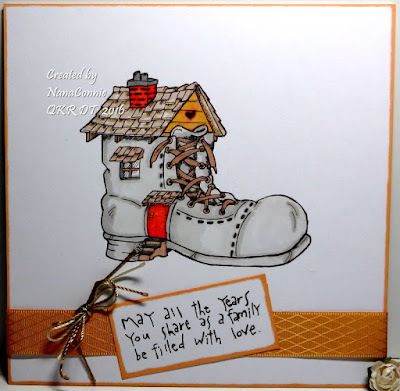 :-D My card uses a wonderful digi image and a sentiment from QKR: 16201 "Shoe House" and 17308 "All the Years." This card will be used for a family who has just purchased their first home. New year, new home - how exciting is that? I thought the image was simply adorable. I can hardly believe that in all the months I've been on the DT for QKR, to say nothing of the couple of years I'd been using their stamps before joining the DT, I had somehow not seen this image! Oh, well, that makes it new to me for this new 2016 year. I printed the image directly onto my card front, then colored with ProMarkers. I dug out some ribbon from my stash, printed and cut the sentiment, inked the edges of both the sentiment and the card, and found some of my newest twine to make a triple bow. Very CAS and perfect for showcasing that cute shoe house. I'm sure I don't have to tell you how much I adore animal images, especially felines, :-D When I saw this freebie from the Stamp of the Month Challenge at From the Heart, I fell in love. It went right to the top of my priority list. although this time I didn't use the twist. 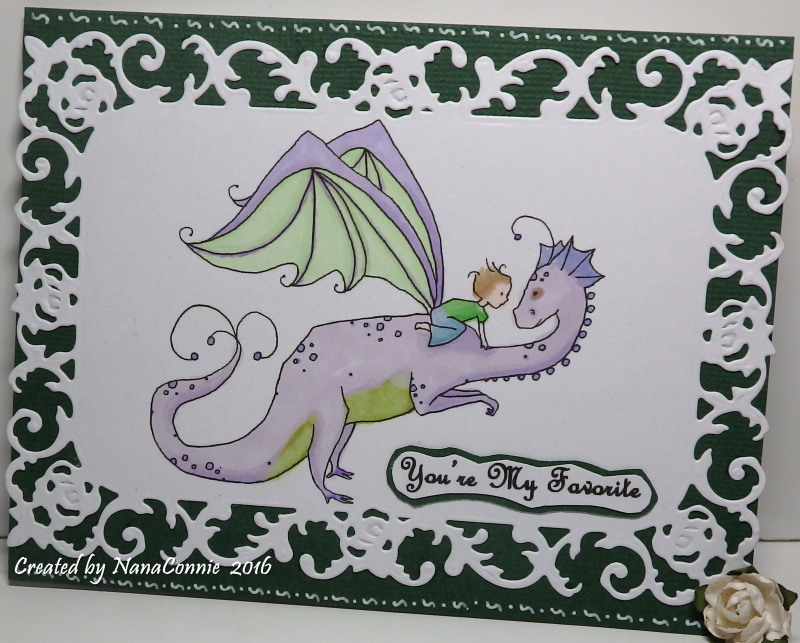 I used ProMarkers to color the image and die cut it using a die from Spellbinders. The blue mat was cut with the same die and I used an embossing folder on it for the Swiss Dots. I cut the sentiment and its mat with one of my oldest die sets, In fact, I think those circle dies were the first ones I ever owned. I embossed the mat for it also. The two ribbons are from Really Reasonable Ribbon (both of them new!) and the purple dp came from Paper Studio (also new.) I left it pretty CAS so that it would work for either a gal or a guy. 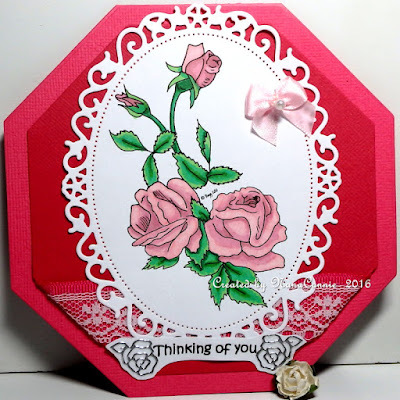 These fantastic roses were drawn by Sandi Huggett (Sandi's Samples) and the image was a freebie for the Progressive Challenge at The Outlawz. With a simple sentiment, I thought they would work beautifully for a Valentine card or for any feminine greeting card, for that matter. to choose my colors but had to add green for the leaves. I used ProMarkers to color the roses and Copics for the leaves. I used a die from Spellbinders to cut the image and dies from QuicKutz to cut the card and the mat behind the roses. The pastel pink lace was in my stash, as was the grosgrain ribbon behind it. I added silver rose embellies to the sentiment and the bow is hand-sewn.